The tropical shrub lantana (Lantana camara) grows approximately 6 feet high with an 8 foot spread. A few varieties grow like vines and easily climb trellis structures or arbors. Leaves measure 2 to 5 inches and emit an unpleasant aroma if crushed. Both leaves and stems are covered in rough hair. Flowers are produced in clusters that measure 2 inches. About 100 varieties of lantana are available for the home gardener as of 2010, according to Floridata. Lantana grows successfully in a wide range of soils that are well-draining. It can easily be grown in full sunlight or partial shade. The plant grows in USDA zones 8 to 11. The plant is a vigorous grower and in certain locations, such as Florida, it has easily naturalized into the wild setting and is found throughout the state. 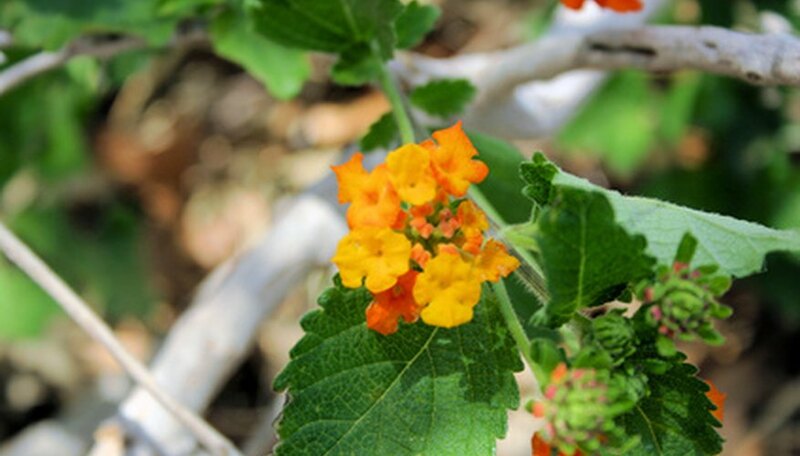 The lantana shrub grows easily in high humidity or arid, desert-like conditions. It will not tolerate a temperature dip below 28 degrees. The top growth will quickly die, but when the weather warms up, the shrub will grow back from the root system. In cold regions lantana is often grown as an annual each year. Lantana requires very little water to flourish. It is a popular plant for xeriscapes. When first planting lantana, keep it moderately moist, but once established, yearly rainfall is usually enough to maintain the plant. Flowers are produced from summer to fall in abundance. Blossom colors are yellow, bronze, orange, pink, lavender and purple depending on the variety. Many varieties produce blossoms that feature up to three unique shades in one globe. Butterflies and hummingbirds adore the flowers and flock to any garden with lantana in full bloom. The berries of the lantana appear blue-black in color and contain seeds. Songbirds enjoy feasting on the berries but they are toxic to humans and mammals. All parts of the lantana are poisonous to sheep and cattle. Sterile varieties are now available which produce no berries. This reduces the danger of unwanted spread or escape from cultivation.